Come walk me with, room by room, through my home to see how I have organized, adapted, decorated and arranged my Intelligent Nest to make it a warm, attractive, fun, educational and livable place to relax, work and enjoy raising a family. In other words, come learn what makes my home, an intelligent nest! 1) Accessible: If your child is suppose to use an item on a daily basis, and it is safe for the child to access the item freely, then they should have access to the item. Also, every room that you use daily that your children are allowed to accompany you or play in, should have items or areas that are openly available for their use. These two concepts come straight from Maria Montessori’s teaching that children are at work during every aspect of their day and they primarily work through their play. 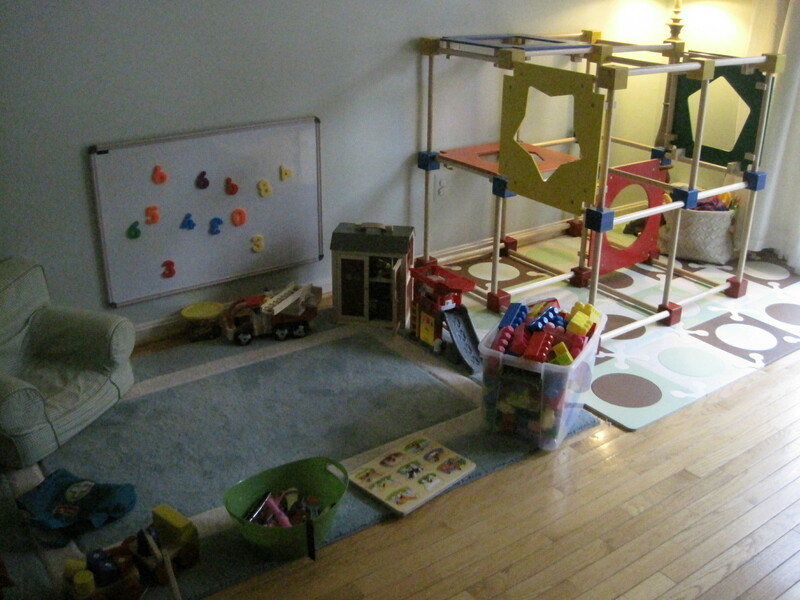 Providing opportunities to promote play and work at home keeps your child’s mind engaged. Also, the more play and work opportunities sprout from a child’s autonomy (ability to choose, start, engage and complete play and work) the more meaningful and engaging the play/work will be. 2) Reasonable: Just like a successful diet plan, overhauling your home needs to be gradual and the steps need to be reasonable. Begin with one area at a time and start and complete a room before moving to the next. Keep your expectations reasonable and give everyone time to adjust to their new surroundings. 3) Attractive: The human eye likes beauty and symmetry. It focuses more on organized, orderly and attractive scenes than those that do not meet that criteria. One of the best ways to achieve symmetry at home is to organize. From there, pick attractive colors to paint with and use consistent colors and themes to tie the home together. If you don’t have an eye for decorating, ask a friend to help or hire a professional. 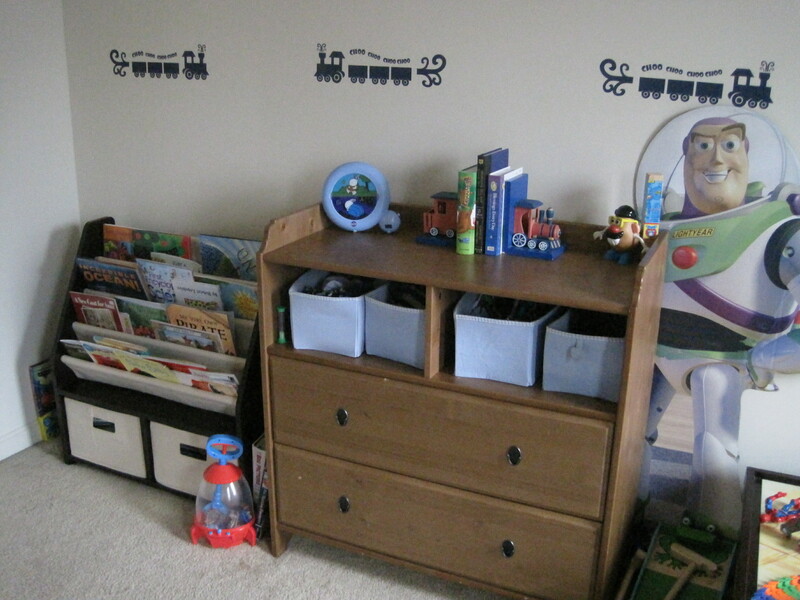 4) Every item needs a home: If a child wants something, they need to know how to obtain it independently (without demanding, crying and yelling). 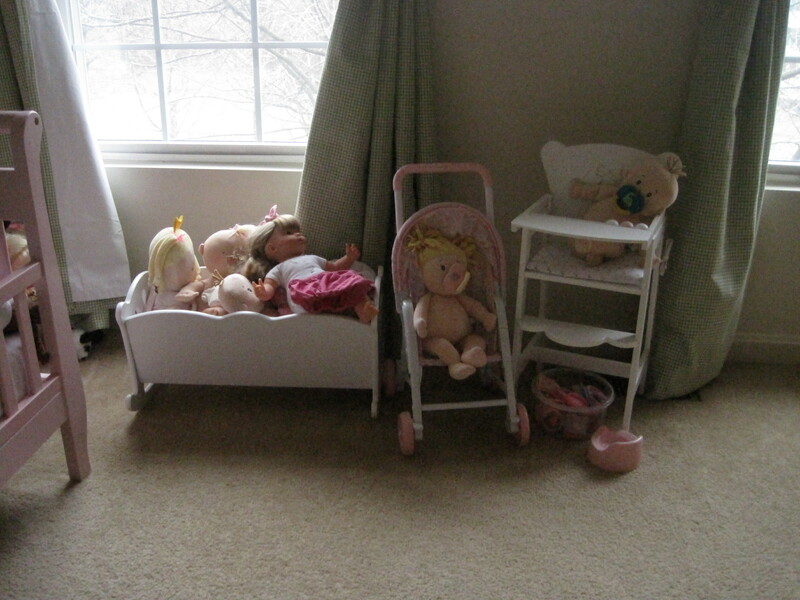 The best way to help a child, help themselves is to assign a home for every item in your nest. If a child wants blocks, they know to look in the closet. If a child wants a bowl, they know to look in the drawer by the sink, etc… Take time every evening, together, to put all your things back in their spot. 5) Livable Balance: I had a good friend tell me, after spending upwards of $50,000 on decorating, that she isn’t comfortable in her home. It is beautiful, exquisite even, but not very livable. Some parents with kids intensely try to grasp hold of their pre-family home and have a hard time letting go of elegant, but unsuitable furniture, decor, rugs, etc… Other parents jump all to quickly into the minivan-mode and fill their home with kidopalooza overnight. 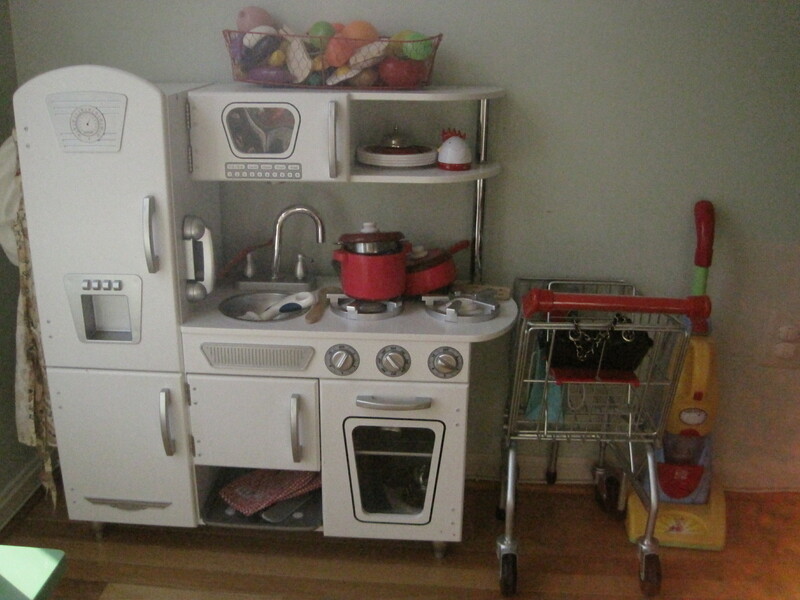 The kids love this, but it often doesn’t appeal to adult senses and needs. 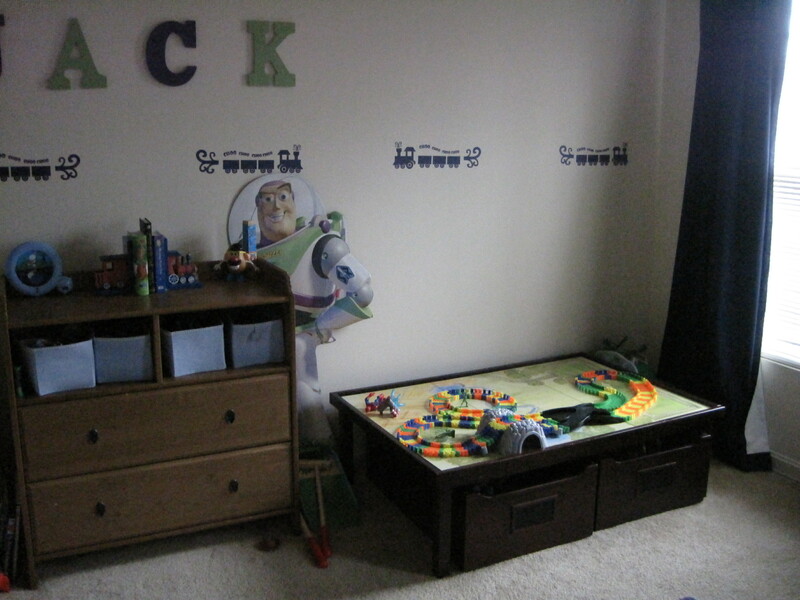 Try to strike a balance between kid-space and adult-space and hopefully plenty of rooms will serve and appeal to both child and adult senses. Welcome to my Intelligent Nest! The Foyer: Notice there is a (large!) 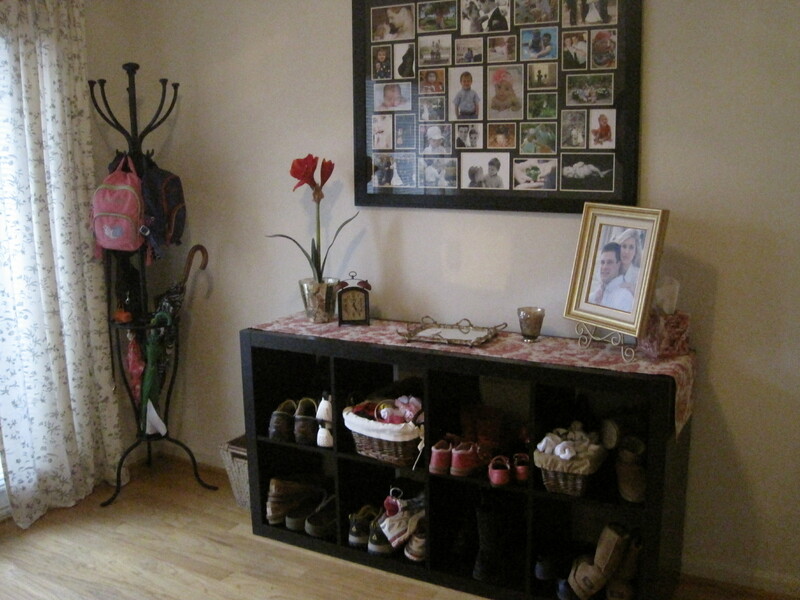 shoe and sock organizer right in the entry way so that everyone can find, access, put on and put away their own socks and shoes. Also, notice the benches for sitting while working on putting on and taking off shoes. 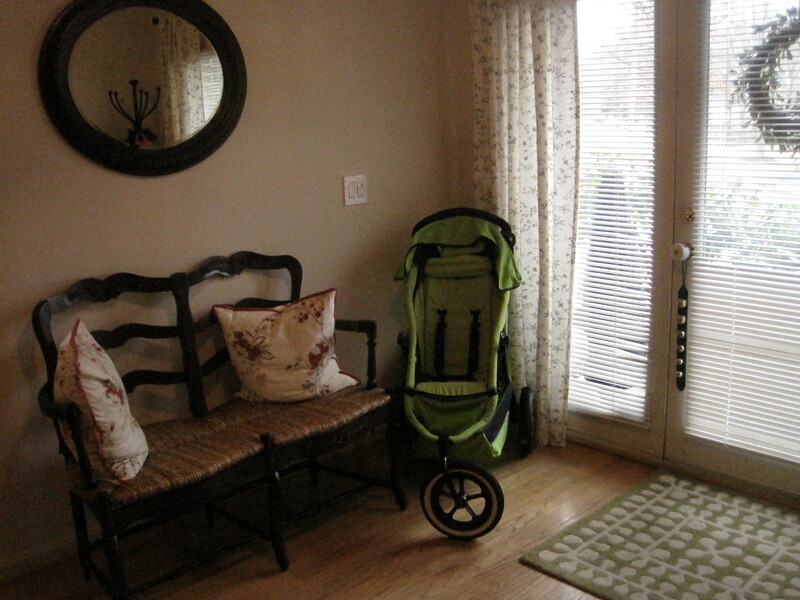 The stroller is out and ready for kids to hop into independently or help load up with snacks, water and sand toys. There is a accessible spot for umbrellas and backpacks. We hang coats in a coat closet nearby and so the children are required to hang their coat on the doorknob to the closet since they cannot reach the hooks in the closet on their own. 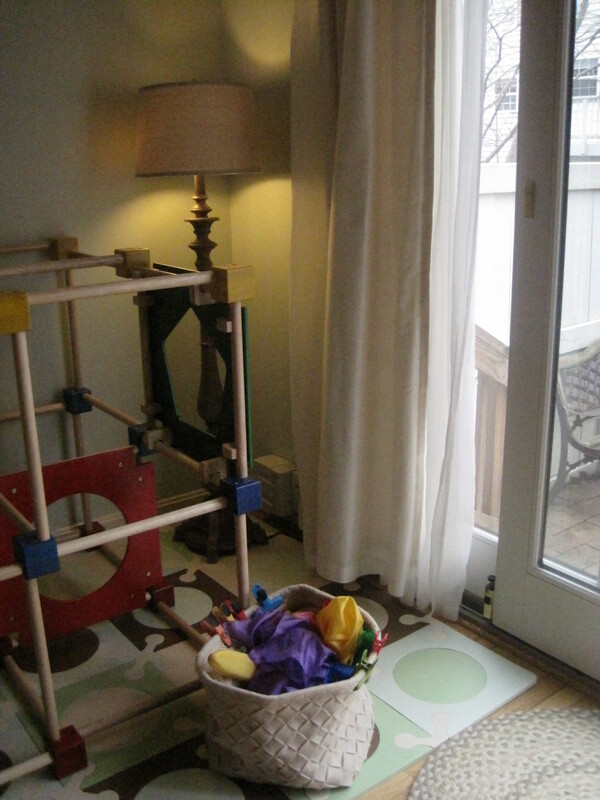 The Grossmotor Playroom: Rough and tumble play welcome! Most certainly a 100% kid-zone, but still has a bit of an attractive quality (at least to me!). 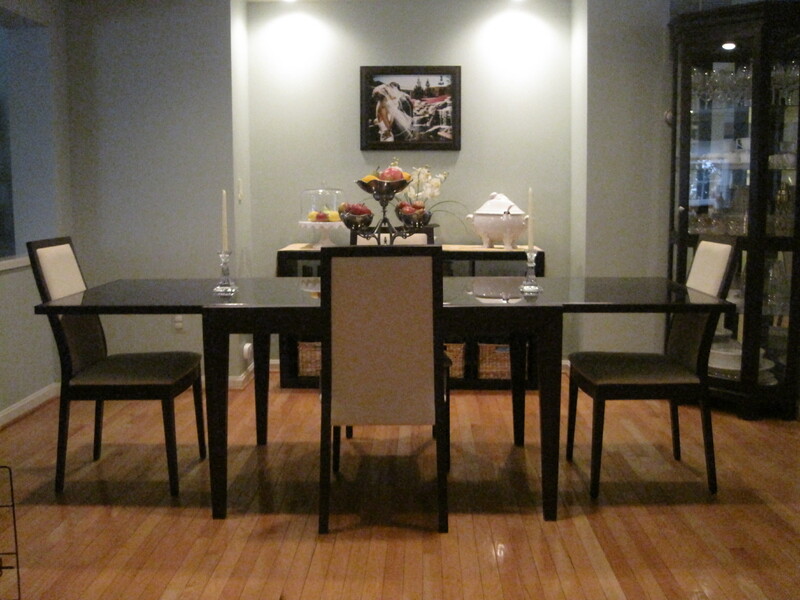 The Dining Room: My sanctuary… this is not a kid friendly room. The glass, sharp edges and fragile items scream “adult only!” Kids are not invited into the dining room at our home, except for on special occasions. They have so many other lovely areas to live, work and play. 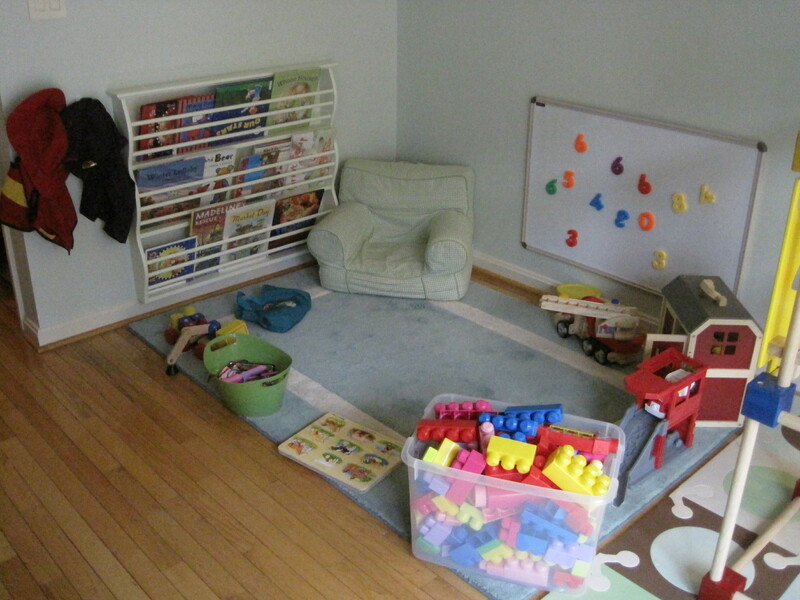 I like to use this room for adult only items and projects that are not suitable for little hands. 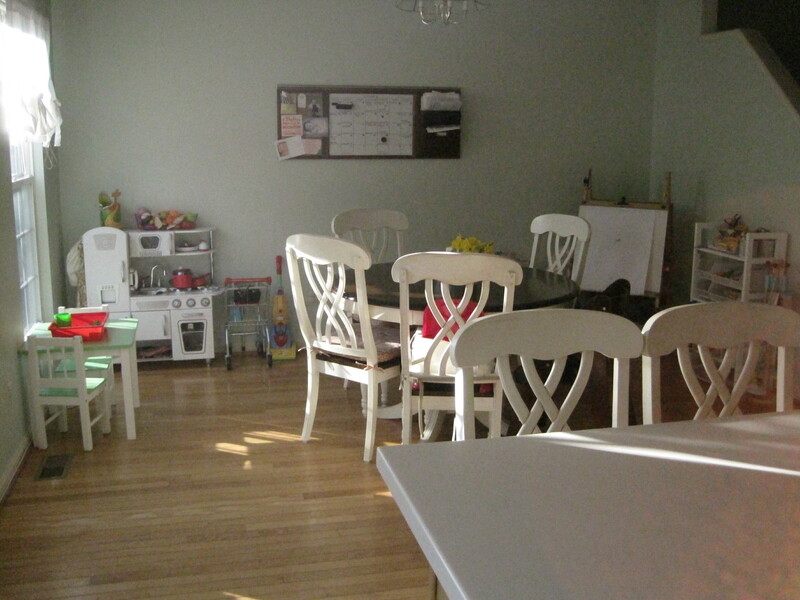 The Kitchen: Children are invited to work alongside adults in the kitchen only at the island. The main counters are an adult only space. Although, we keep two drawers with kid utensils, dishes, bibs, etc… so that they can participate in preparing and cleaning up after meals. Children are always invited to watch and help at the island, as we only place kid-safe items there and keep all the knives and hot objects on the regular kitchen counters. 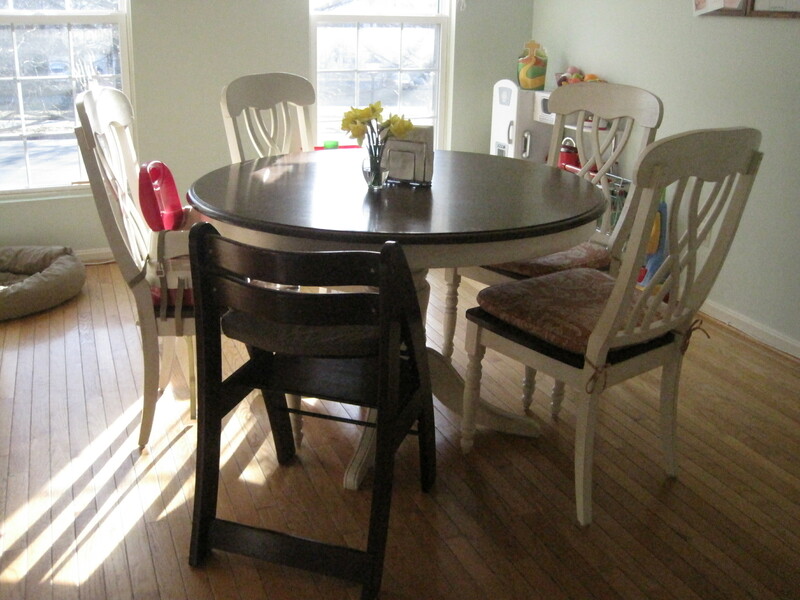 The Breakfast Nook: You will notice two child-friendly chairs at our table, but children are always welcome to sit in the “adult” chairs as well. Napkins are always available at the center of the table. 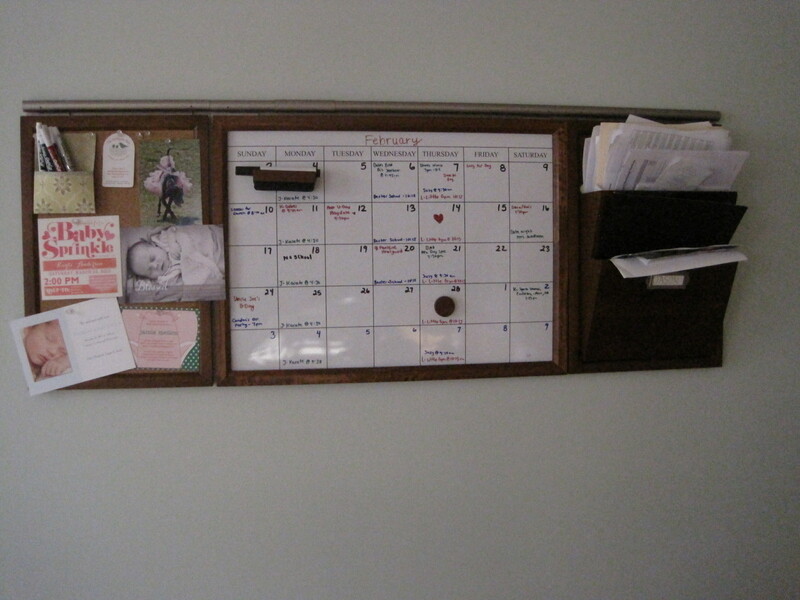 The family calendar and announcement board is posted on the wall next to the table so that we can discuss the days activities and upcoming events. 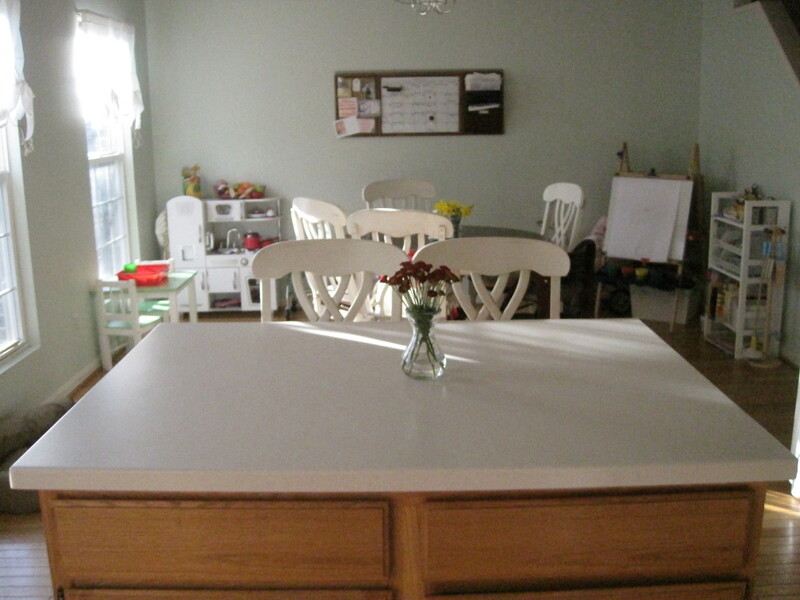 Our breakfast nook is large and so I squeeze in an activity center/table with activities that change daily, a kitchen play area and an art center. There are also clean up items, like brooms, dust pans and mops so that the children can help take responsibility for their spills and messes. 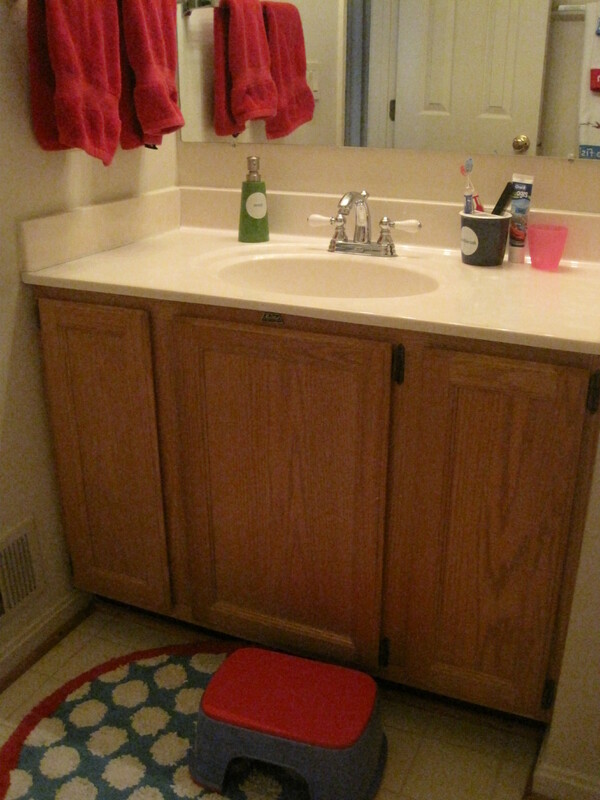 The Powder Room: A accessible towel is handy on the tank of the toilet for drying hands, a double step stool is available, as well as an easy to use potty seat. 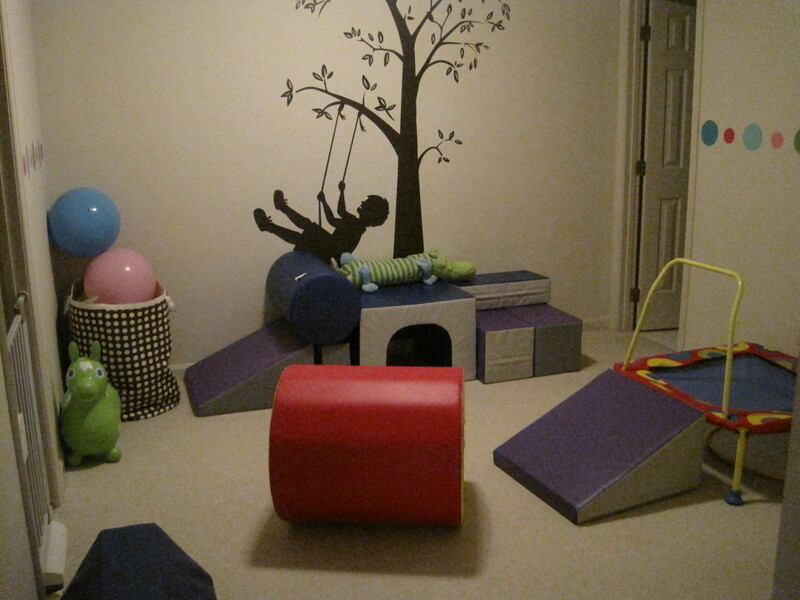 The Playarea: A kid-zone, most definitely, but I used colors and wood tones that appeal to my adult senses so that it is easy and pleasing to look at and enjoy. 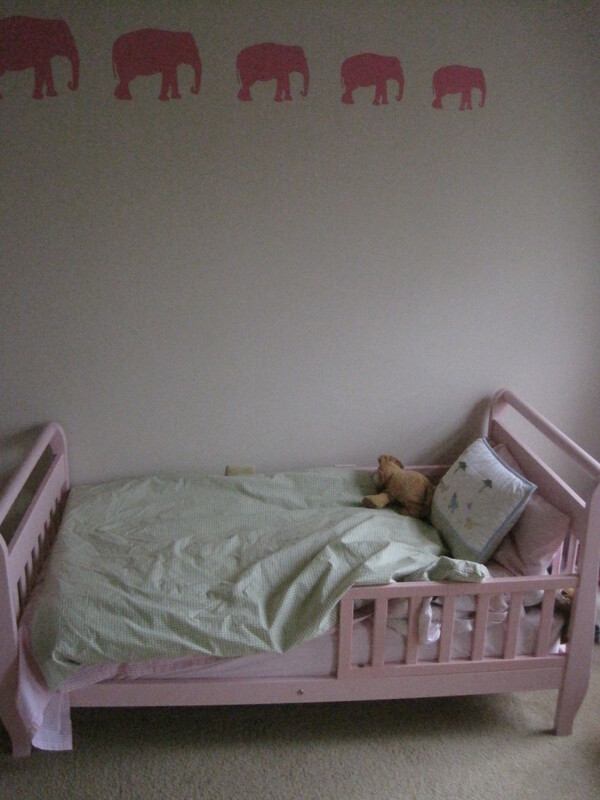 Notice in the last picture of the playarea that I have curtains that have proven to be irresistible to children. 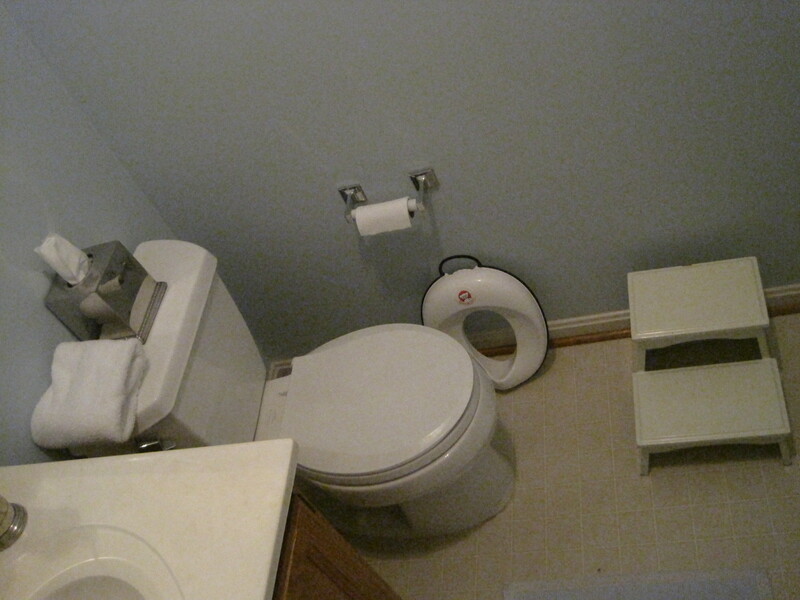 Sometimes you cannot change an aspect of your nest to make it “kid-friendly”, but you can offer replacements. To avoid children playing in my curtains, I offer a basket of large, soft, silk squares next to the curtains that children can use to their heart’s content. 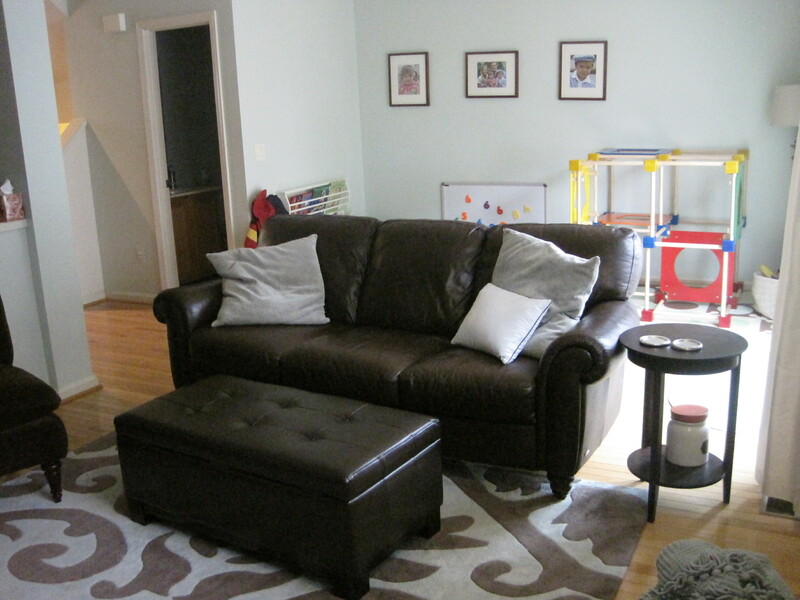 The Family Room: Soft, wipeable fabrics make for a great family room. 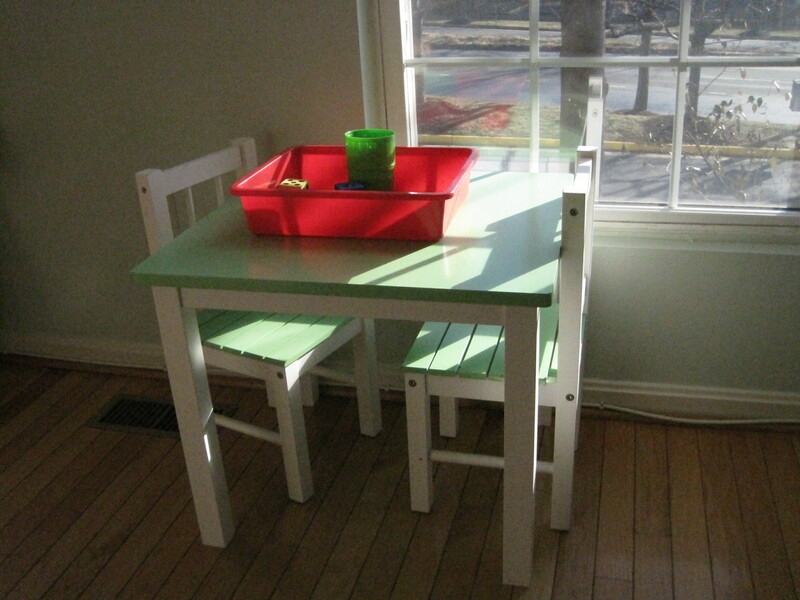 Choosing rounded edges on the tables and chairs helps you to avoid the tacky stick-on child proofing materials. 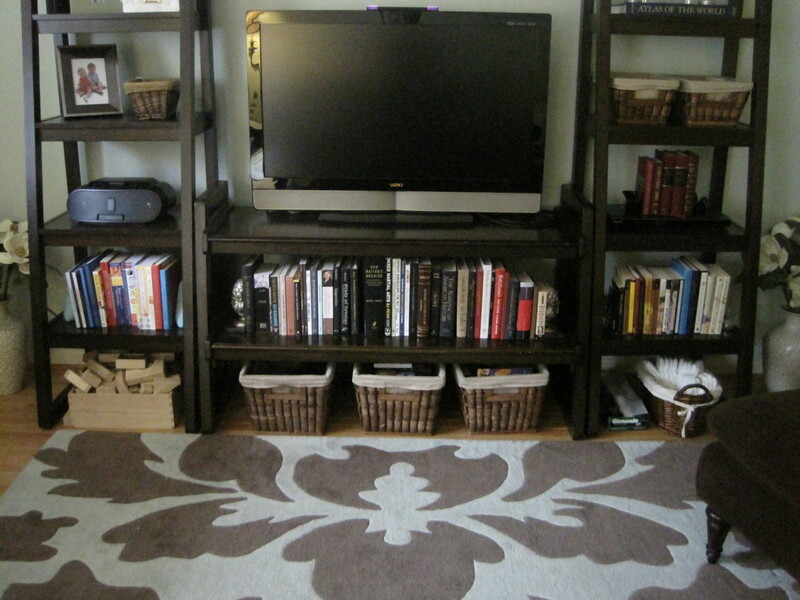 The bottoms row of our entertainment unit has baskets with kid items out of view, but not out of reach. 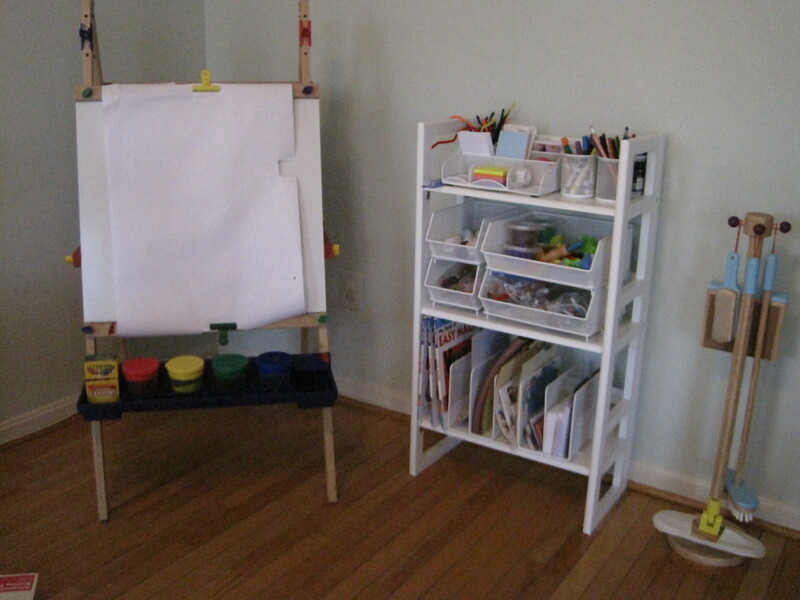 There is also a diaper basket so that the children can access, set up and help clean up their own diaper changes, as well as a classic set of blocks that everyone loves to use. 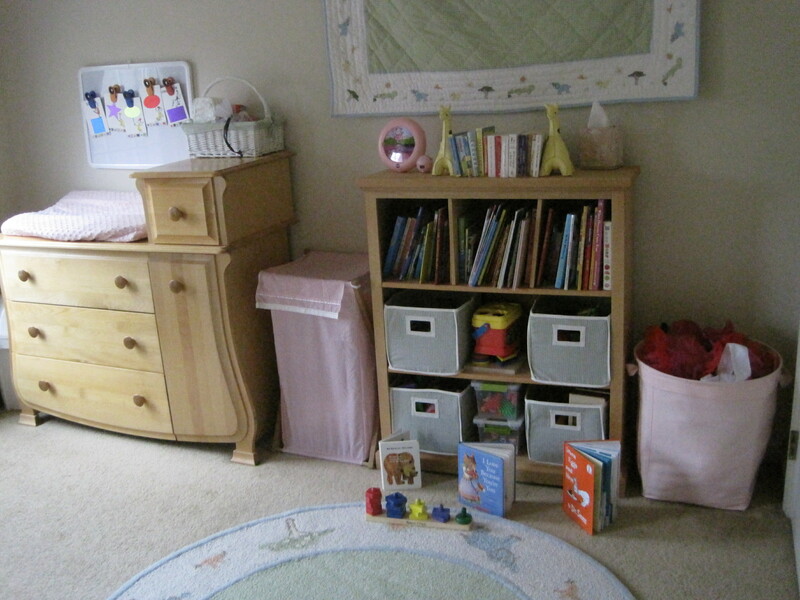 The Kids Rooms: Books, clothing, laundry baskets and toys should be accessible. 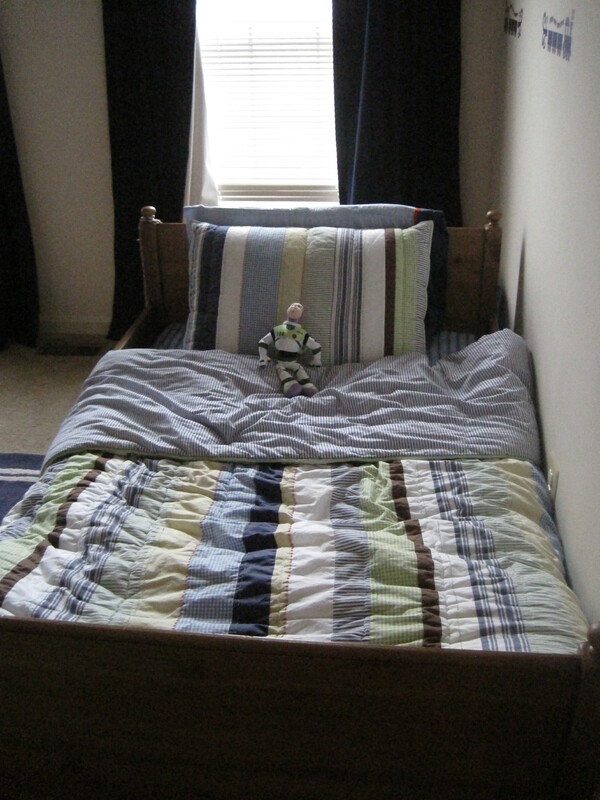 Using simple bedding that children can actually use helps kids learn to make their bed from an early age. 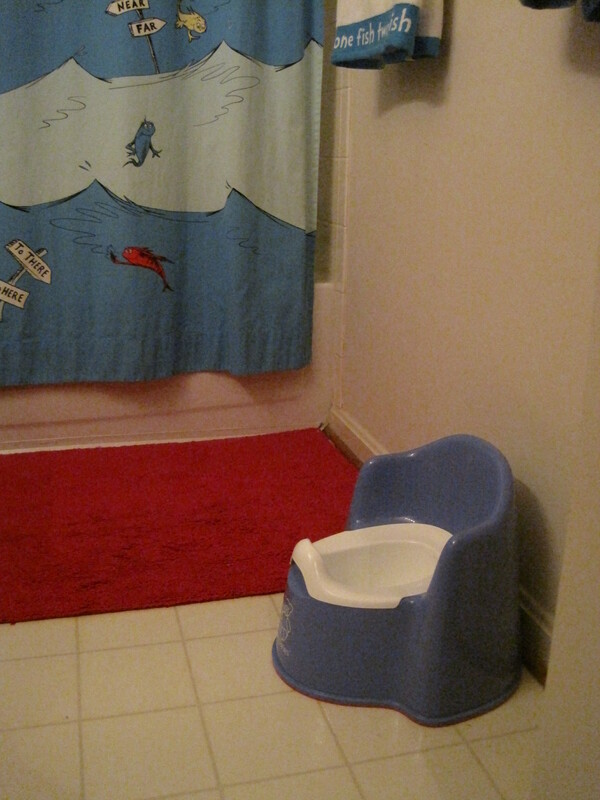 The Kids Bathroom: Bath toys are out and ready for use, all potty seats and stools are available and toothbrushes, soap and toothpaste are on the counter, accessible by stool. 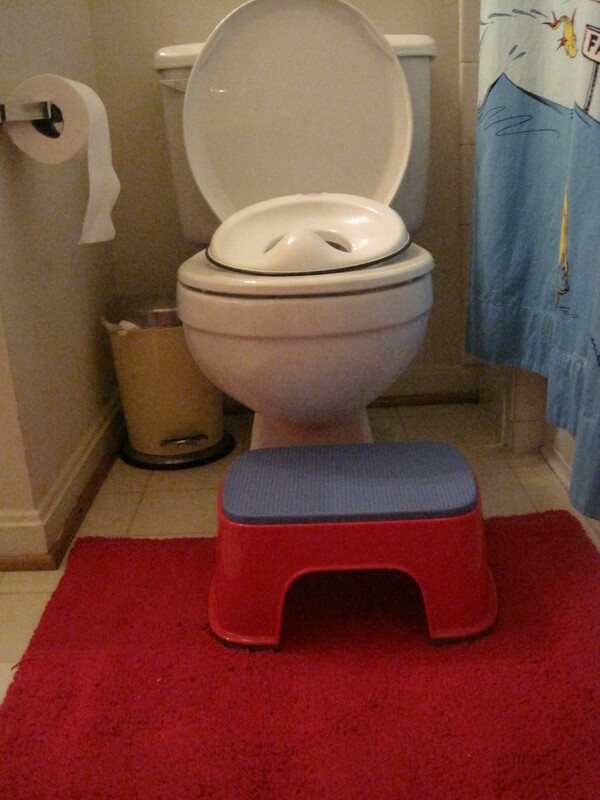 If you have multiple children using one bathroom, I recommend investing in 2 or 3 stools to avoid the constant struggles over whose turn it is to use the stool. 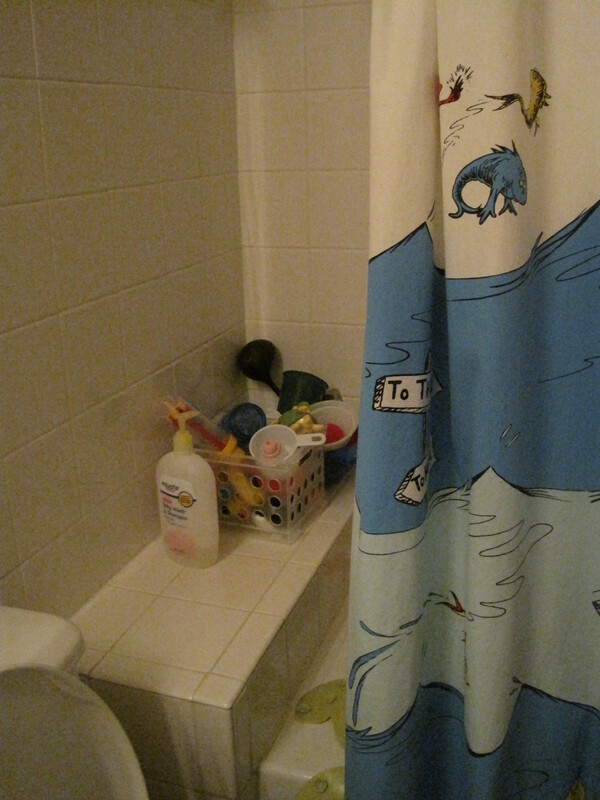 Master Bathroom: An adult bathroom at it’s finest, but I keep a bucket of random items for the children to sort through and play with while I shower and primp. 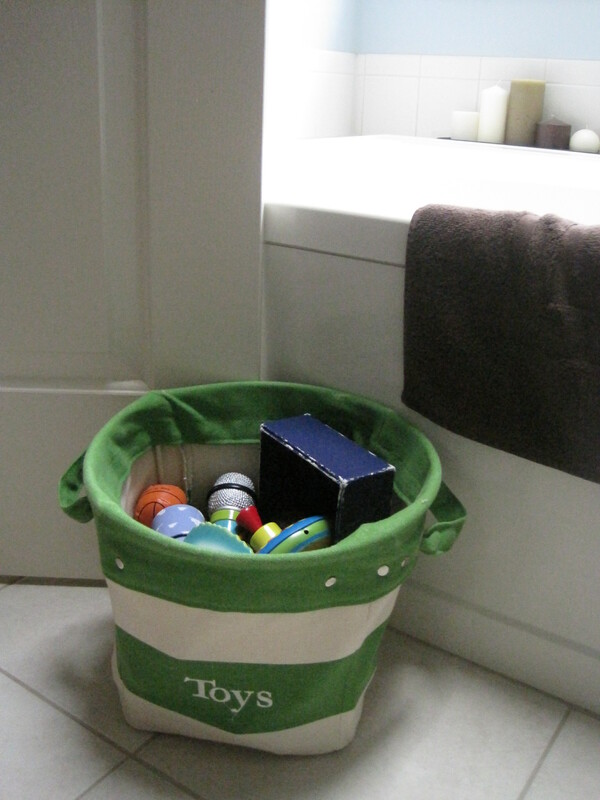 Find little boxes, cloth baggies, ribbons, pieces of old toys, etc.. for your basket of randoms. Kids love being creative with the mismatched set. Remember, every home will have different needs and no two homes need be the same. What works for me, might not be feasible for your family and what is wonderful for your family, may not work well for mine. Hope you found a couple useful ideas on our tour today. Please feel free to share your best ideas from your intelligent nest below.